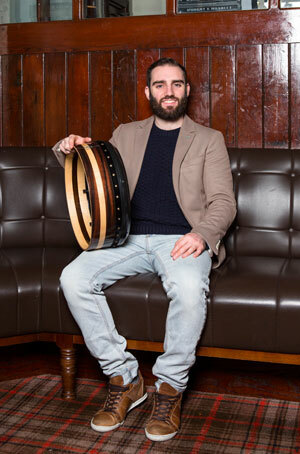 Robbie Walsh is a bodhrán player who hails from Dublin. Brought up through a strong musical background in all genres, his style is the definition of diversity. Inspired by the fantastic playing of his uncle, Robbie began to learn the ropes from the great Noel Dowling of Kilkenny in what he feels is his second home Áras Chrónáin. Taking these skills to the vibrant session culture throughout Dublin Robbie began to shape his style. In 2008 Robbie became the Dublin, Leinster and All Ireland Champion thereby opening him up to further opportunities. He has played with various different bands including Ciorras, Coras, The Hunters, Keeva, B*witched, Blasta and The Jeremiahs. He has also worked closely with dance shows and companies such as Celtic Céilí, Celtic Legends and Damhsa to entertain and teach audiences at theatres, festivals and corporate functions stretching as far as the United States and the Middle East. Robbie has also worked on albums with musicians such as Daoiri Farrell, Alan Doherty, Laoise Kelly, Gerry O’Donnell, Tom Walsh, Seamus Begley, Joe McKenna, Paul Kelly, Eleanor Shanley, Brendan Hayes, Colin Farrell and Frankie Lane to name but a few, and has shared the stage with the likes of Donal Lunny, Karen Tweed, Cormac Breathnach, Gerry O’Connor, Brendan Begley, Niall Keegan, Blackie O’Connell, Robbie Harris, Siobhan Peoples, Tola Custy, Antonio Beresky and Paul Brady. With such a gathering of experience throughout his musical career Robbie set up The Bodhran Buzz to further extend the knowledge of the bodhrán throughout the world via workshops, private teaching and regular classes. Our Twitter feed is currently unavailable but you can visit our official twitter page @fourwindsmusic.